With our flight at one o’clock there was time for a leisurely breakfast, packing and a final stroll along the strand alongside flamingos and large numbers of chestnut-banded plovers, or to look at common waxbills in local gardens. Greater flamingos close to the Strand at Walvis Bay. Having only one minibus available wasn’t a problem for the group as Walvis Bay airport was such a short distance away. Geoff ferried up those staying at Flamingo Villas first and was soon back at Lagoon Loge for the rest of us. We paused briefly for thousands of lesser flamingos at a former water treatment plant, a dense flock of them in the water behind a single black-necked grebe and many in the air as some people approached. 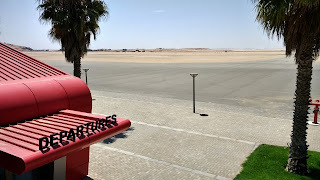 Airport in the desert, last view of Namibia (David Bennett). Walvis Bay International is very much an airport in the desert. We had an uneventful wait there before walking to the plane for the flight to Johannesburg. In the meantime Geoff and Darrin went back to the garage in Swakopmund: repairs would take time so they returned to Cape Town in one minibus, leaving the other for the vehicle hire company to collect later. The group had a long wait at Johannesburg with plenty of time to walk between check-in and security areas and for shopping. The overnight flight back to the UK passed without incident and we arrived at Heathrow early on Sunday morning, 25 November. November’s guided walk at NWT Thorpe Marshes was on a lovely mild morning. Stonechats are overwintering on the reserve for the third time and both of the pair showed well for the group of 20 people. However winter birds, such as ducks on the gravel pit, St Andrews Broad, were all but absent. The riverside footpath isn’t always the nicest with some muddy patches, but it feels sheltered and lush. Keen eyed group members found two interesting bugs tucked into the stinging nettles and white dead-nettles. I guess any experienced bug observer would know them, but I couldn’t name them straight away and that feels like a good reason to share their names and pictures. Much as most of us would know blackbirds and chaffinches, or red admirals and large whites, common bugs feel like a learning curve worth tackling. Thorpe Marshes regular Susan Weeks showed herself to be that experienced bug observer and came up with the right IDs on the spot. Well, I was impressed. For several years I have kept track of the fortunes of some bee orchids in urban Norwich. It all started by accident when I was cycling past and noticed both a bee orchid and a man with a strimmer. That conversation led to an annual visit to a patch of grass - now a wild flower meadow - outside Big Yellow Self Storage on Canary Way, opposite Norwich City FC’s football ground (for exampleBig Yellow bee orchids are back, June 2016). Fast forward ten seasons and leaving the flowers to grow and bloom has become routine here – in a good way. Never mind the orchids – the show of ox-eye daisies is reason enough to stop and take a look. Of course ox-eye daisies are common on roadside verges, but somehow sandwiched between a garage and a supermarket alongside the inner ring road they have extra appeal. Not surprisingly the flowers were buzzing with bees when I took a close look on 5 June 2018. 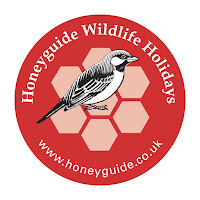 The Honeyguide brochure for 2019 will drop on doormats soon. This year it will be in an envelope rather than polythene wrap. The colourful covers will be hidden, but the aim is straightforward – to avoid single use plastic. I’ve used the same local mailing house, Cavalier, for many years. I also meet my main contact there from time to time on the youth football circuit, another reason to stay loyal. Magazines from the National Trust and RSPB now come in a see-through wrap made from potato starch, like the material used quite widely for food waste bins, and these compost readily. Could the same, I asked, be arranged for the Honeyguide mailshot? They had reservations. Starch wraps have short shelf-life. If there’s no demand, there is soon a decomposing pile in the warehouse.